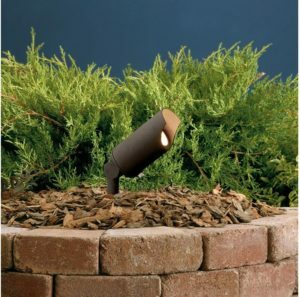 The goal of landscape lighting is the highlight the features in a landscape in a natural way. More is not always better. The Las Vegas strip with lots of lights glaring is never the goal. Every property is also different and always requires a custom designed plan to suite the specific features found in that particular landscape. 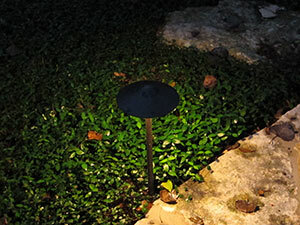 There are also many methods to lighting a landscape. 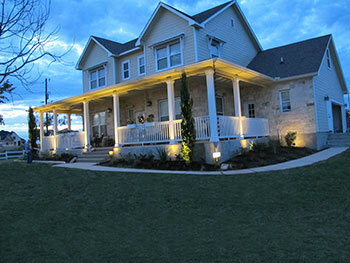 Up lighting a home is what comes to mind when lots of people think about landscape lighting. Trees can be up lit along with many other landscape or architectural features. Down lighting from trees or other objects can create lit areas of interest in a landscape or gently light dark pathway or other traffic areas. 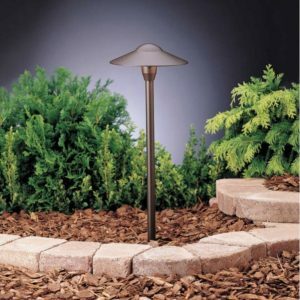 Path lights are a great way to light traffic areas and are probably the most popular type of lighting. Besides merely illuminating areas lighting can create atmosphere and areas of interest out of objects or areas that appear to be average by days but quite spectacular at night. 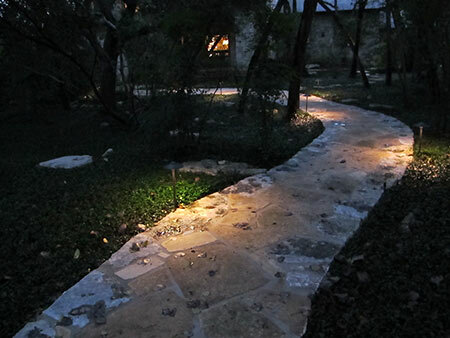 The goal with landscape lighting is to conceal the source of the light as much as possible. You want to see the target being illuminated but not the source. When you can see the source of the light it creates glare which is not good. The light also needs to evenly cover the target. When too much light is concentrated on an area it creates what is called a hot spot. This creates an overly lit and unnatural look. Light needs to be applied evenly and gently to get the proper effect. 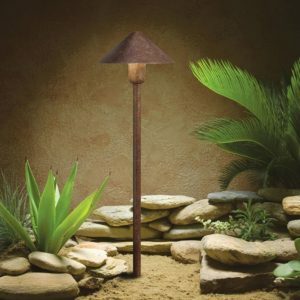 Plantscape Solutions designs and installs low voltage landscape lighting from companies such as Kichler and FX Luminaire. 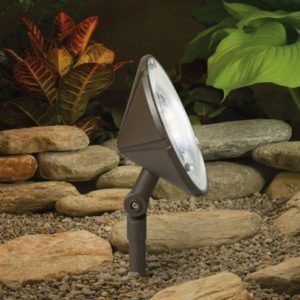 Kichler is our go-to line of outdoor lights used because the price point and quality is hard to beat. FX Luminare offers some additional styles and new transformer features. 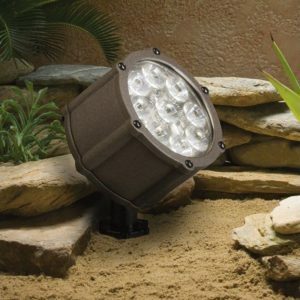 We have the ability to get many other brands of outdoor lighting as well. We are members of the Association of Outdoor Lighting Professionals (AOLP) and adhere to standards that go above and beyond what most companies are willing to do. When we estimate a project, we apply a special technique to the wiring process soldering the landscape lighting wire splices prior to adding wire nuts. Wire nuts are intended to be used on solid core wire where they will easily bite and self thread properly forming a cohesive bond. Landscape wire is made of up fine stranded wire that does not have the ability self thread and form a strong locking bond inside of the wire nut. In other words, we’re professionals and stand behind our work. 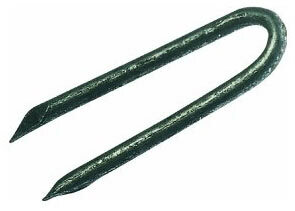 Over time the weak stranded wire bond inside of the wire nut can pull apart or corrode causing a short to occur. This can cause the wires to heat up and become a fire hazard. By soldering the wire splices you create a solid mass of wires that allows the wire nuts to work as intended. The soldered connection is also more conductive so each splice does not cause the amperage flow to bottleneck. In addition to using the high quality soldering technique we use the patented lighting heat shrink process that is endorsed by world renowned landscape designer Jan Moyer. 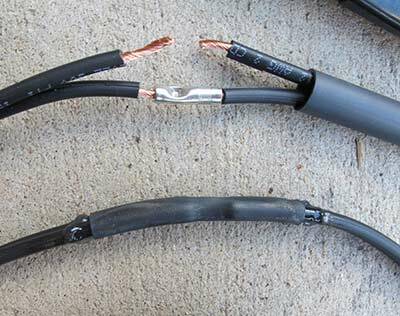 This process uses a combination of a solid crimped connection in conjunction with heat shrink. The crimping process gives you a very high strength connection. The heat shrink keeps out the corrosive moisture and maintains a highly conductive connection that prevents voltage drops or shorting. 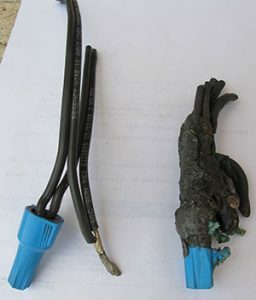 When repairing existing systems cupric oxide buildup is often found on the wires which looks similar to carbon buildup. The cupric oxide resists the soldering process but we can solve the problem with the crimp & heat shrink process very easily. We simply use a crimping tool to splice the wires together. Then a section of heat shrink tube is places over the connection. The last step is to use a special heating torch to heat and shrink the shrink tube over the splice. You end up with a very sound finished products. A small amount of conductive grease is added to the connection prior to crimping to create a very conductive and corrosion resistant connection. Traditional tree staples for mounting cables can pull cable into the tree as it grows. We use the more tree friendly eye hole cable mounting system. If the tree tries to pull the cable into the tree as it grows the tie mount is designed to break free and release the cable. 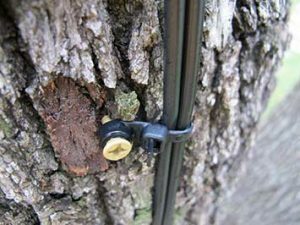 This will prevent the cable from getting pulled into the tree and causing the cable to girdle the trunk and damage your tree. Your tree will thank us for caring about the little details like this. The cable mounts are UV protected for long life. The days of using incandescent bulbs are pretty much over. Some of our older incandescent Kichler systems that we installed ten years ago have even been converted to LED by simply changing the bulbs. This is called doing an LED retrofit. 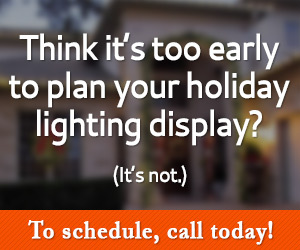 You can buy incandescent fixtures and install them with retrofit LED bulbs or buy actual LED dedicated fixtures. There are benefits of going the retrofit or LED fixture route. Either type of LED system will produce a more consistent light output then you can get with a incandescent system. You will also decrease your power consumption by up to 85%. The benefit of choosing the retrofit LED fixtures are a lower cost and you have the ability to change to a higher powered bulb as size of the material in the landscapes grows. The Kichler LED bulbs come with a six year manufactures warranty which is hard to beat. A big drawback of the incandescent bulbs is the lifespan can be as short as six months with frequent use. With Kichler LED bulbs getting ten years of use is not uncommon. Below are some examples of retrofit fixtures that we have used for many years. LED fixtures are sealed units that keep out moisture and unwanted pests like fire ants that can ruin a fixture. Kichler calls it’s LED lights the Design Pro LED line which utilize Radiax Optics. These LED fixtures will produce a slightly more refined and uniform light spread then you can achieve with a retrofit bulb. If your wanting the absolute best light fixtures on the market the Design Pro line would be hard to beat. Here are some examples of the many types and styles available. With incandescent bulbs the lumen output (brightness) and Kelvin Scale (light color) is totally dependent on the of voltage level. As the voltage goes up the lumen output increases and the color of the light actually changes from a warm white to more of a bright white. The ideal color is usually about 2700 Kelvin for a warm white look. A few volt variance in a lighting zone can greatly alter the Kelvin range and cause distortion a well trained eye will notice. Because incandescent lights use more power there is usually going to be a two volt variance in your average system even under ideal conditions. The computer chips in LED fixtures and LED retrofit bulbs will both adjust to the voltage input level and deliver very uniform lumen output and Kelvin scale color. Technology has definitely improved the quality of landscape lighting and reduced the power consumption in the process. 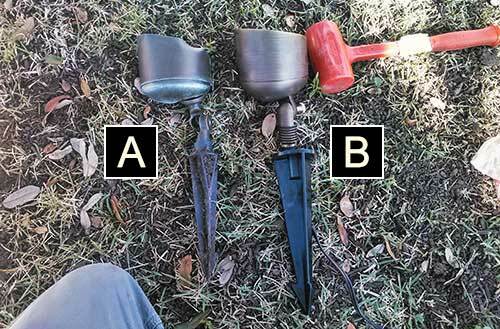 We only uses quality fixtures that can handle the abuse a Texas summer can dish out. The fixture labeled “A” in the picture below was installed by another company but after only one year the finish was coming off the fixture and it needed to be replaced. All quality fixtures are made in a mold that creates a durable cast fixture. The failing light was actually a cheap stamped fixture made from thin sheets of metal similar to how a disposable tin can would be made. Small little screws and some luck were what held the fixture together. The fixture had no seals or gaskets to keep out water and prevent corrosion. The fixtures was so poorly constructed all it took was your bare hands to crush the fixture like soda can. 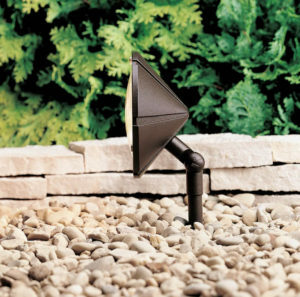 The fixture labeled “B” is a quality cast fixture that was used as the replacement light and demonstrates the type of quality fixtures that Plantscape Solutions uses. The light was fully sealed with gaskets to keep moisture out and prevent corrosion. The fixture was constructed from solid brass and came with a lengthy manufactures warranty. The fixture is solid brass so it will never have problems with the finish. Our work is our reputation so we only sell and install quality fixtures that will make us look good for decades to come. A good way to tell if you’re dealing with a company with high standards is always look for the AOLP logo. Not All Lights Are Created Equal!